Its been a while since I changed up my lasagna. 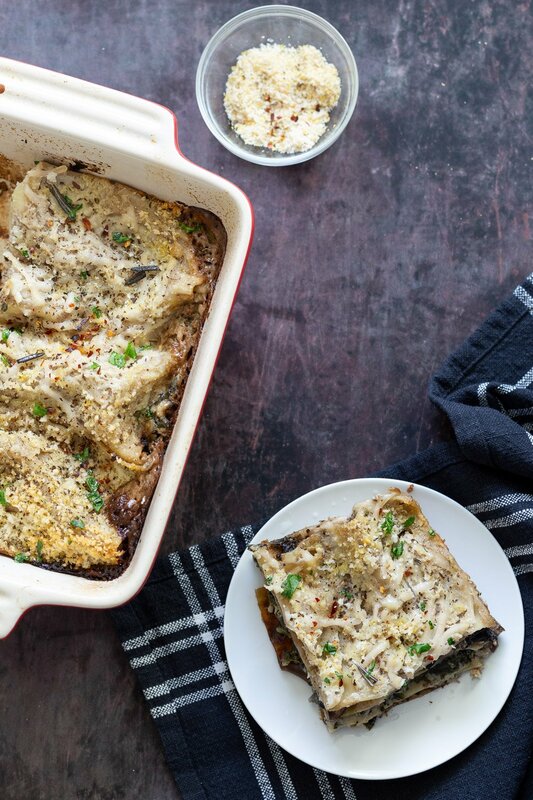 You all love the Baked Portabella mushrooms with garlic sauce, so I put them in a lasagna! 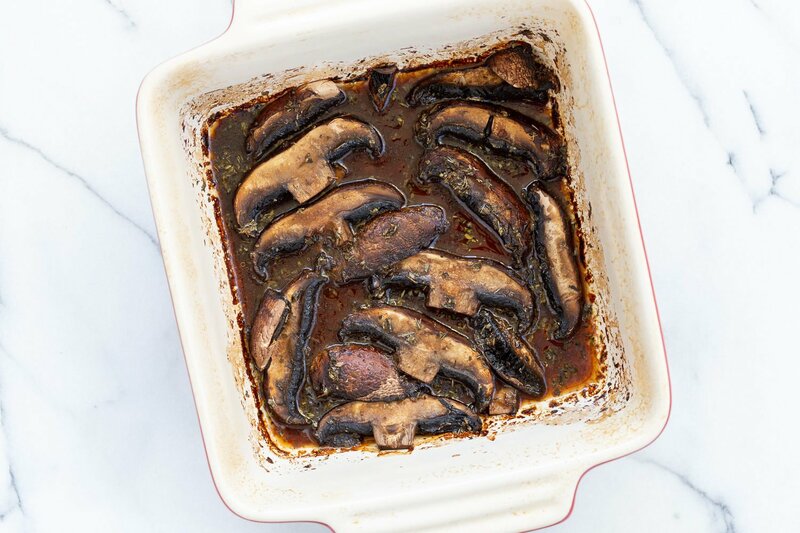 Mushrooms are marinated in a garlic, balsamic, soy marinade then baked, Meanwhile blend the garlic sauce and keep ready. Assemble the rest of the ingredients. Then start layering! Garlic white sauce, noodles, mushrooms, sauce, noodles, a layer of spinach and tofu ricotta, noodles and repeat. 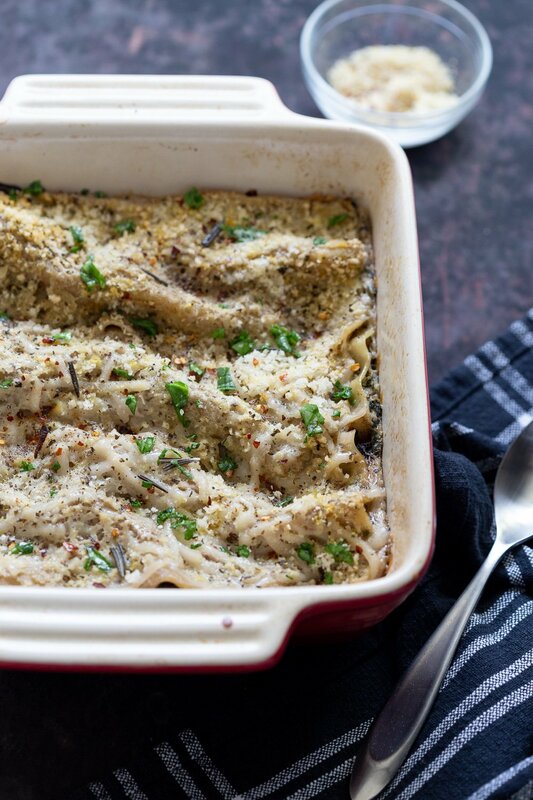 Top with vegan parmesan or vegan cheese and bake. Once baked, drizzle olive oil on top and add fresh herbs, slice and serve. For a quick meal, you can bake the portobello mushrooms until done, heat the garlic sauce to thicken then toss cooked pasta (fettuccine or penne) and fold in half of the sliced mushrooms and serve the rest on the side. Fold in some baby spinach when the sauce is simmering. Mix the marinade for the mushrooms. Drizzle over mushrooms and bake. Blend the garlic sauce ingredients until smooth. Start layering with garlic sauce, noodles, mushrooms, sauce, noodles, spinach, ricotta, noodles, sauce and repeat. 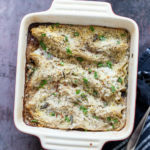 Top with vegan parm or vegan cheese, cover and bake. Use my nutfree Cauliflower Alfredo or Pumpkin Alfredo instead of this nutty garlic white sauce. You might need a double serving. Definitely add some tofu ricotta or other vegan cheese between the layers as the nutfree sauces reduce in volume while baking. 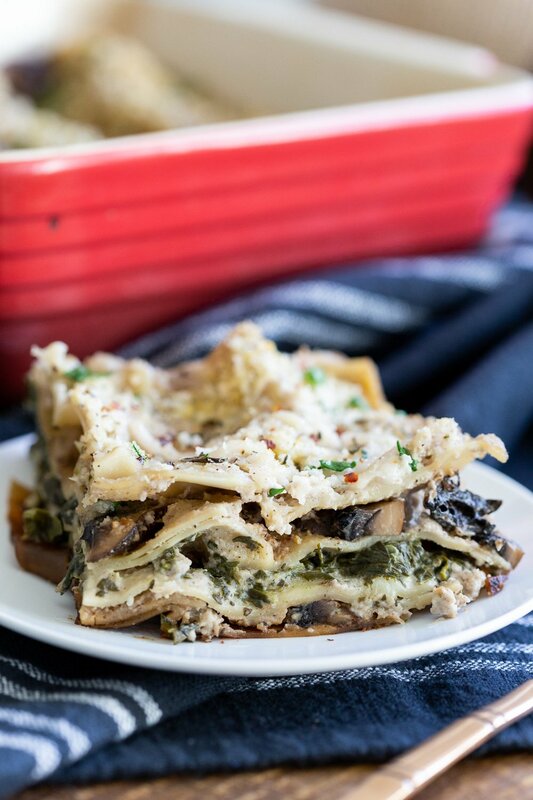 Add a layer of marinara and roasted veggies for a hearty Spinach mushroom lasagna. No Boil noodles tend to absorb a lot of moisture during cooking and can sometimes dry the lasagna out sooner. Soak them in hot water for 2-3 mins, then use for less drying out. 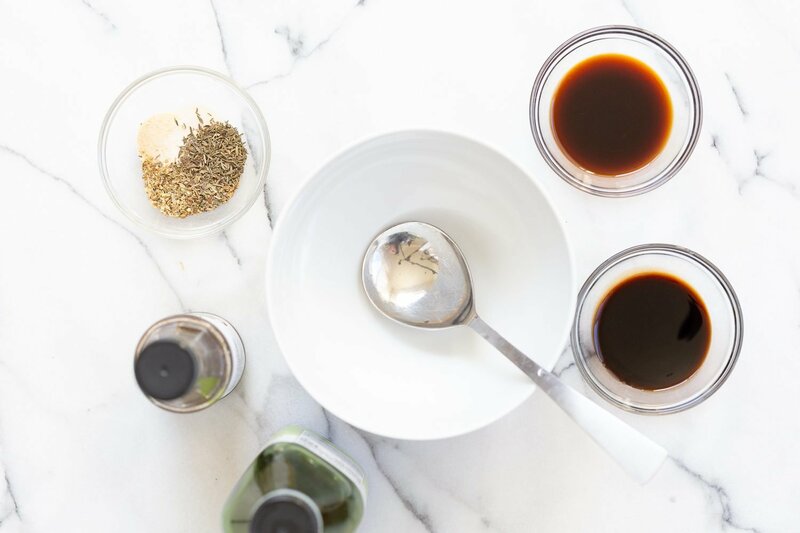 Mix the mushroom marinade ingredients minus the water in a bowl. 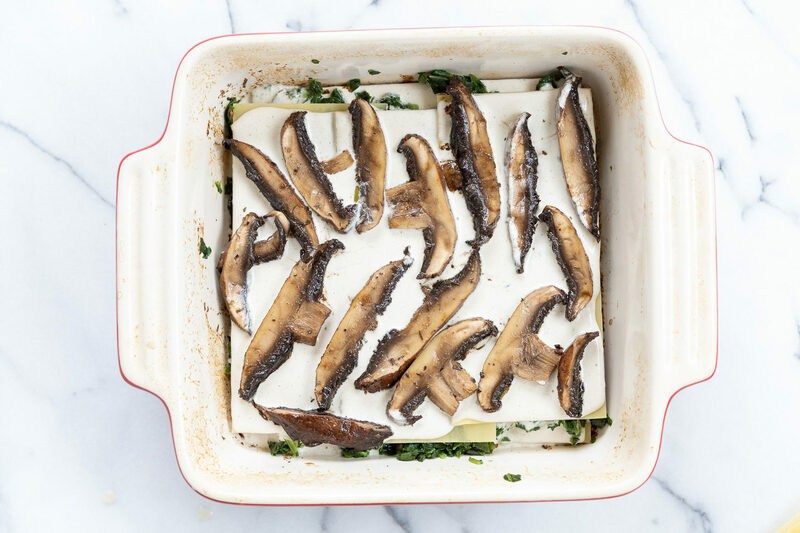 Place the whole mushrooms* in the lasagna baking dish. Drizzle the marinade all over the mushrooms. 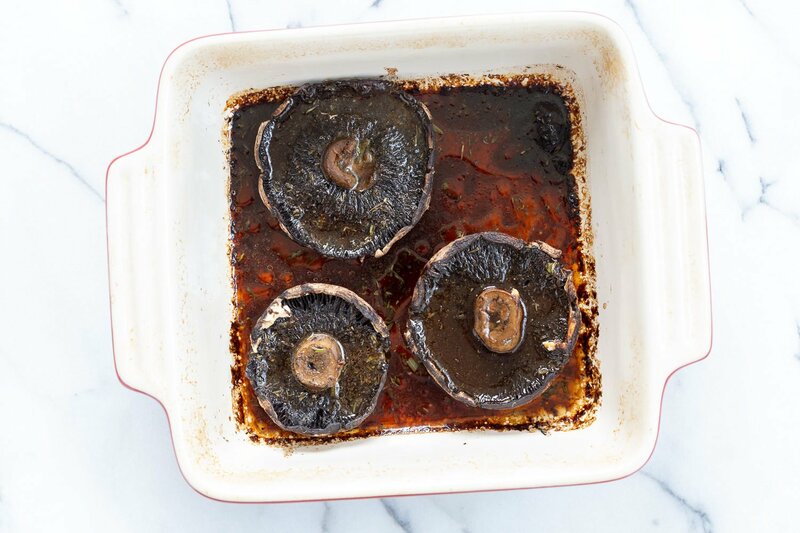 Use 1/4 cup of water or broth to rinse out the marinade bowl and our on the sides of the mushrooms. Bake the mushrooms covered at 400 deg F (205 C) for 20 mins. Remove the mushrooms from the dish. Slice into 1/4 inch or less width, and set aside. Leave the juices in the dish. Blend the garlic sauce ingredients until smooth. Taste and adjust salt and flavor. Assemble: Add a ladleful of garlic sauce in the dish. Add a layer of noodles. Then drizzle garlic sauce on the noodles, arrange sliced mushrooms on top, drizzle some sauce over the mushrooms, then add a layer of noodles. Spread the sauce on the noodles, then add wilted (if fresh) or thawed spinach (if frozen). Sprinkle some red pepper flakes and a good pinch of salt over the spinach. Add some tofu ricotta** or drizzle some garlic sauce over the spinach. Cover tightly with foil and bake at 375 deg F (170C ) for 1 hour. Let it sit for 10 mins, then uncover. Sprinkle more vegan parmesan, extra virgin olive oil, herbs and pepper flakes. Then slice and serve. Store refrigerated for upto 4 days. Variation: Add a layer of marinara and some sauteed veggies in the middle. ** Quick Tofu Ricotta: Crumble 7 oz firm tofu in a bowl. Add 1/2 tsp garlic powder,1/2 tsp dried basil, 1 tsp extra virgin olive oil, 1 tsp apple cider vinegar, 1 tsp lemon juice, and 1/4 tsp salt &pepper. Mix and let chill for 15 mins, then adjust seasoning and use. 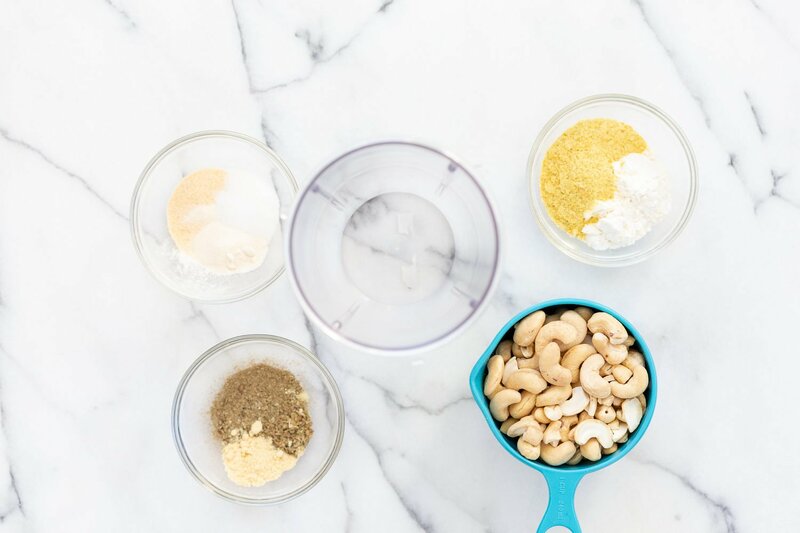 Nutfree: Use my nutfree Cauliflower Alfredo or Pumpkin Alfredo or my bechamel style flour sauce instead of the garlic white sauce. You will need a double serving of the sauces. *** No Boil noodles tend to absorb a lot of moisture during cooking and can sometimes dry the lasagna out sooner. Soak them in hot water for 3 mins, then use for less drying out. If using regular lasagna noodles, cook them to al dente and then use. Nice Creamy Vegan Mushroom ! 1. In the ingredients, you list “1/2 ground mustard or miso or both.” One half what, exactly? 2. At times the store has portos that are kinda puny. Other times they’re as big as manhole covers. Then again, maybeI can get are plain white mushrooms. Could you suggest a quantity by weight? So many ounces or grams of mushrooms? Looking forward to making this on the weekend. 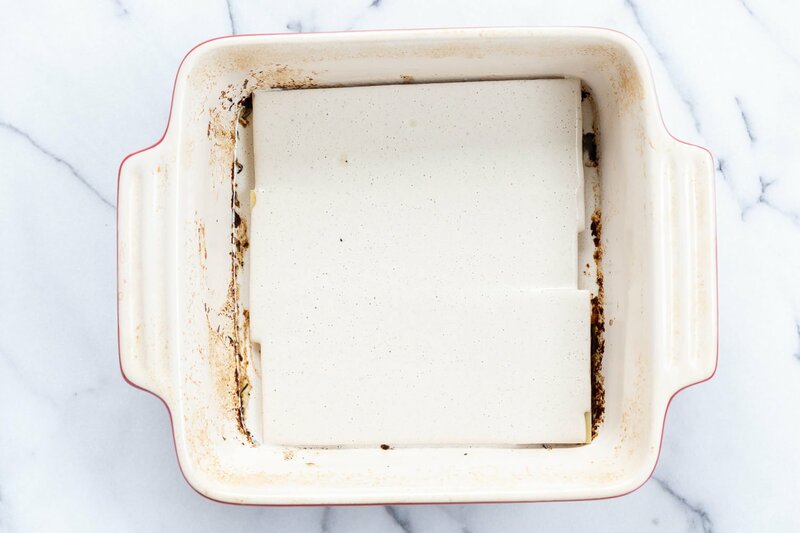 What size Lasagna pan did you use? Gah! So creamy and tasty and perfect! And the portobello marinade is freaking amazing. These mushrooms are out of this world. I wasn’t in the mood for pasta, so I marinated the mushrooms, cooked for 10 mins, then I piled on the ricotta and continued cooking until done. They are so great; I’m making them again today for lunch. Thanks for another winning recipe Richa!! So I carelessly only read through step 3 before I shopped and interpreted the “vegan cheese” to just be another name for the vegan parm…..will I miss the ricotta very much? I can wait until I can get tofu if you guys or Vegan Richa think it’s a necessary flavor to add! We’re up in the colorado mtns and only get out to shop weekly and I was going to make this tonight…I can’t wait, it sounds delicious! Thanks in advance!!!!! Amazing!!! Another winner. Thank you! This was amazing. It fed two people for two nights! The man just couldn’t get enough of it!!!!! My careless pre-reading of the recipe caused me not to have Vegan Moz’ and Vegan Ricotta, but it turned out great!!!!! 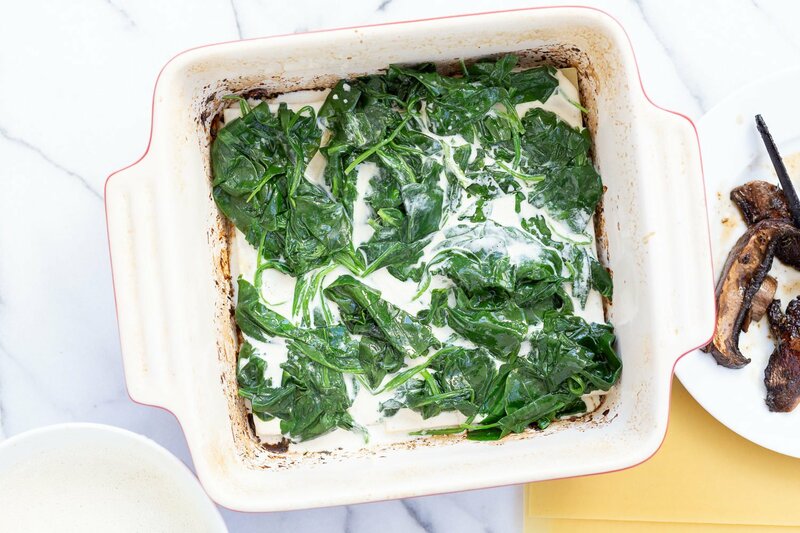 Next time, we’re adding more spinach and maybe some of the suggested vegetables to one layer. 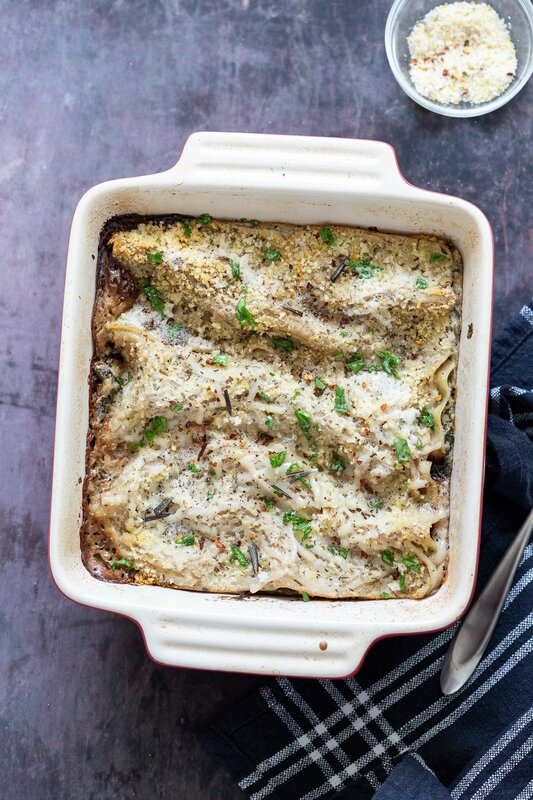 We used brown rice lasagna noodles, cooked them al dente as instructed, and they were perfect. I also added one big portabello because I had 5 and next time I may add even more….it’s like having MEAT!!!! Thank you Vegan Richa, another hit!!!!!!! Oh, we made it one night and had it the next, rewarmed in the oven cut in pieces covered in foil for a half hour or so at 300. It was easy to cut when it was cold and it reheated beautifully. I just have to further add that the spices were fabulous. The taste experience of the mushrooms baking was so wonderful I had to hit the man’s hands to keep him from eating the slices of portabello as we assembled the dish. I may use those mushroom slices in tacos or just as a side. I mean, THE SPICING WAS PAR EXCELLENCE THROUGHOUT–the sauce AND the mushrooms’ baking mixture. awesome!, yes the mushrooms can be used in various ways!